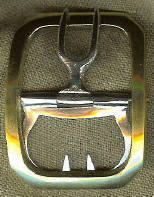 BCS128 buckles The original buckle was found along the Sandusky River, Rathfelder Farms, Fremont, Ohio but a fairly similar buckle may be found on page 36 of Gentlemen on the Frontier: A Pictorial Record of the Culture of Michilimackinac by E. Petersen. It will accommodate a normal man's shoe strap width of 1". 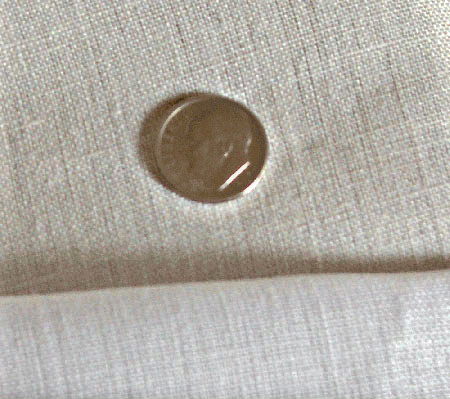 The overall dimensions are 2" by 2 5/8". In The Virginia Gazette in 1775, "RUN away from the subscriber . . . a Dutch servant man . . . a baker by trade . . . Had on, and took with him . 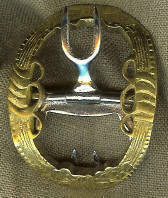 . . with a pair of brass carved shoe buckles".